Posted by Jane in Wall Stickers Recommended on May 20, 2014 . The number of the people who are applying vinyl wall decals to decorate their house has been tremendously increased. For most people, they spend the majority of the daily time living, having meals and staying with families at their own space.They do need something to make themselves relaxed and comfortable. So if the walls they are facing are attractive or maybe a little inspirational and motivational, gazing on it for a while when survive from the heavy work will definitely offer an instant relief from the huge pressure of life. This new type of home decoration is made of vinyl which is harmless to human bodies and is designed into different styles and patterns. If you just come across our online shop, please stay for a few minutes, you will never be regretful for that. 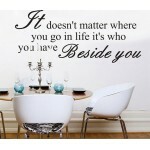 Today, I would love to introduce one of our best sellers, that is quote wall stickers. This kind of innovative interior decor contains quotes or sayings from some outstanding figures. These sentences are usually said with the inspiration and motivation that will gain you confidence and courage to face the challenges in life. Or there are also some name text wall decals available on our website. You may choose the font and color of your name paper as you like. Also, we are providing the customized stickers for you. This may be your grandma’s saying or just what you want on your wall to act as a reminder for you. Wall stickers with some inspirational quotes and sayings are widely liked by many customers since they can stimulate the self confidence in people and give the potential to meet the difficulties in life. We are offering a large selection for you to choose from. Such as “You have brains in your head and feet in your shoes, you can steer yourself in any direction you choose!” by Dr. Seuss. Or “I’ m selfish, impatient and a little insecure. I make mistakes. I’m out of control and at times hard to handle. But if you can’t handle me at my worst, then you surely as hell don’t deserve me at my best.” by Marilyn Monroe, one of the famous lady of the world. For more quote wall decals, you may visite our quote and saying category to choose the one that is the perfect fit for you. Posted by Jane in Wall Stickers Recommended on May 14, 2014 . I think for many people in the eastern countries, the most anticipated festival is definitely the Christmas day. During that time, people can have a long holiday and get together with families and friends. While, what are they doing before that exciting period? Of course, they will decorate their house to add more holiday atmosphere first. One year is nearly gone again, and it is time for us to renovate our own space or business areas for the expected coming year. Decdecals maintains a plenty of holiday theme stickers as well as normal ones for the buyers to shop from. As for Christmas day, we provide you the stickers about Christmas trees, Santa Claus, sleigh, sled dogs, Christmas socks and other holiday stuff that you can imagine. If you are busy with your work and don’t have enough time to do shopping in the mall, but you specially want to make your house new and fresh with some decors, our online shop is undoubtedly the best solution of your problem. Just visit our online shop and choose some stickers you like, then they will be fast delivered to your door steps. Also, the installation is so simple. Just a few seconds will bring you a fantastic decoration. Besides the Christmas theme stickers, the normal ones are also our top sales. How amazing these stickers are? How high-qualified they are? We are waiting for you to evaluate. If you miss this great online shop, it means you will miss the chance to turn your house into an art gallery. 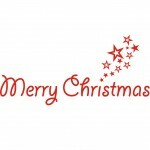 There are also other holidays you may send a wall decal as gifts to your belove ones. We are providing new year wall decals, Valentine's day wall decals, and customized wall decals to be made to order in your preference. It will be your big loss if you miss this innovative gifts to your friends, families or someone you love. And the wall decal put up on the wall will remind the receivers of you all the time. It is also a way for the important people to keep you in mind. Just click your mouse and pick up some wall decals on our online shop as a gift. We are looking forward to provide the best service for you. Posted by Jane in Wall Stickers Recommended on May 08, 2014 . At the end of our business day of last week, we received an email sent from a fiancee of a buyer. She was so excited to tell us in the email that her boyfriend proposed marriage to her yesterday at a love house which had been decorated with some love wall decals ahead of time. It was the most unforgettable moment of her in the whole life, so she wanted to send a thank you to us for the great design. It also happy for us to hear from her and get to know that these small wall decals are able to bring such great joy to people. Her boyfriend is one of our customers, and he bought some love-theme wall decals a few days ago. He secretly bought a new house for him and his girlfriend to live after they get married and gave many thoughts to its decoration. One day he came across our wall stickers online shop DECDECALS and was deeply attracted by these lovely and meaningful decals. So he came up with an idea that their new house may be decorated by these love quote wall decals and then he will propose marriage to his girlfriend. After this ingenious idea occurred to him, he bought some love quote wall decals at once and started decorating the walls. Since this kind of wall decals are easy to use, there is no need of applying some tools to paste like glue or adhesive tapes. Just peel off the cover of the decals and paste them on wherever you want. Also they are removable and after being removed there will be nothing left on the walls. And they will look great though over years and years. With such amount of advantages, it just take him a while to decorate the walls. Love quote wall decals are just some love quotes, easy but full of deep affection. When his girlfriend entered their new house and saw some love decals on the wall, he kneed down and came up with a bunch of red roses and a ring to propose marriage. His girlfriend was totally touched by the “in-the-dream” atmosphere. And a “yes I do” was hardly spoken out from her mouth. We were all touched by the true love between the two lovers and feel glad that these love quote wall decals can help people show love to their beloved ones.